As I have mentioned in many other articles, I was away from comic-books from early 1999 until late 2012. Having just returned to them, I am busy getting re-immersed in the genre. Being a former +DC Comics fan, I have stuck mostly with DC's New 52 line of comics since returning, although I have dabbled in a few other series, such as Dynamite's Pantha (I have all six issues) and Red Sonja (I've read issues 0-2 so far and have 3-6 sitting waiting on my tablet), along with a few others. I've bought many comic-books, both digitally and in print, since returning to the hobby just a few months ago (and spent several hundred dollars doing it! ), and I've read quite a few both older back-issues (like Peter David's Supergirl series) and newer ones (including ones just released last week). I've greatly enjoyed my time reading these stories and have, in general, been entertained (except for the awful "H'el on Earth" story arc that DC is inflicting on us poor saps who are stupid enough to like Supergirl). However, despite having fun reading comics again, I've felt like something is missing even from the very best titles like Batgirl and Supergirl. It took me a while to figure out just what was missing, although I first noticed it in the New 52 Hawk and Dove trade paperback. What is sorely needed in many of today's comic-books is down time. By down time, I refer to time away from the action-packed battles that seem to be the main activity our spandex-wearing favorite characters. And yes, like most other comic-book fans, I do enjoy a good "super-battle" and I like a liberal sampling of them in most comic-book issues. However, as with anything else, with super-battles, you can have too much of a good thing. A comic-book can't be all super-battles, all the time, or it loses something. 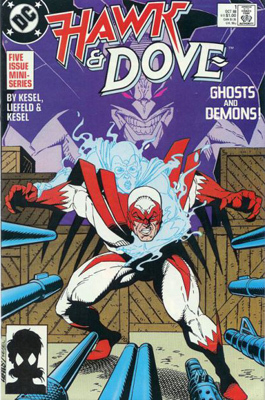 This brings me to a very important, but little-remembered, pair of series from the late 1980s and early 1990s: the Hawk and Dove mini-series, and the subsequent Hawk and Dove full series, co-written by Barbara and Karl Kesel. 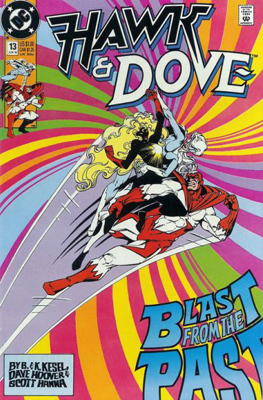 Although there were tons of action and battle scenes in Hawk and Dove, those scenes are not what made this series stand out as one of the all-time great products in comics history. Rather, the down time, the in-between-the-fight scenes, made Hawk and Dove such a wonderful series. Barbara and Karl Kesel understood this fact implicitly, and so if you go back and read the old Hawk and Dove back-issues, you will find a comic with incredible characters and with something the series of today lack almost across the board: depth. 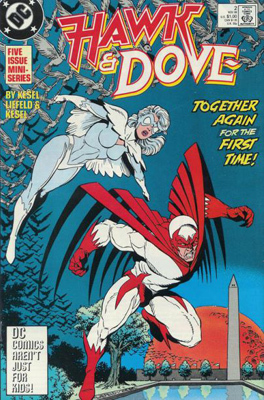 Hawk and Dove began as a mini-series, which re-started the characters after the original Dove, Don Hall, had been killed in the Crisis on Infinite Earths series. 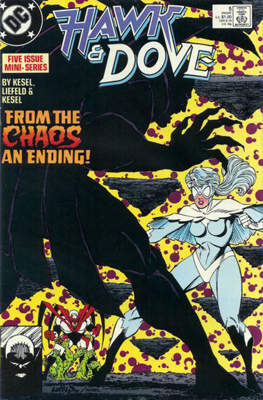 With Don/Original Dove dead, Hawk had worked entirely solo. In his secret identity as Hank Hall, has just returned to Washington, D.C., after a stint out of the country. The problem with Hawk, however, is that he can easily get "out of control." Hawk is chaotic, unpredictable, and often violent when battling criminals. He enjoys combat, and loves smashing perps in the face. The D.C. cops aren't big fans, because they see him as a vigilante who uses too much force and causes as much trouble as he solves. Throughout the first issue, however, we see less of Hawk than we do of Hank Hall. We watch as Hank tries to re-assimilate into his old life, after spending so much time out of the country "superheroing" (which, of course, none of his friends or relatives know about). We witness a painful encounter between Hank and Don's old girlfriend. We watch as Hank argues with his parents and struggles to find his way in the "normal" world without his brother, starting college classes, trying to join the football team, and meeting new friends on the Georgetown University campus. These scenes are not super-battles. They are not exciting or pulse-pounding. But they give us a sense of who Hank Hall is, as a person. They make him human, real. They give us a reason to cheer for him when he hears a mugging happening and steps in to intervene. As the mini-series continues, we meet Dawn Granger, also recently transferred to Georgetown from overseas, a foreign relations major. (Gee, notice that? We actually know what her college major is! Compare that with the New 52 version of Hawk and Dove, where we have no idea if she's even in college, let alone what she's majoring in!) Meanwhile, Hawk is followed around and "helped out" by a woman in a Dove costume, calling herself Dove and claiming to be Don's replacement. Hawk/Hank is violently opposed to any such claim, believing that the woman is defiling his brother's memory. "Dove is dead! Dove is Dead!" shouts Hawk. "No Hank," Dove replies, "Don is dead." Eventually, of course, Hank discovers that Dawn Granger is Dove (I assume you knew that already, or I'd have said "spoiler alert"). But the whole business about Hank trying to figure out who was turning into Dove leads to a critical point: This very important (and often uproariously funny) element of the story could not have happened without previous down time. The only reason the Kesels were able to give us three possible Dove "candidates" and give Hank good reasons to believe each one was Dove, is because they laid the groundwork from the start of the first issue, with lots of "Hank time" in between bursts of him superheroing as Hawk. The "Hank time" led to him meeting and starting to romance Ren; to him meeting Kyle and Donna and befriending them; to him meeting Dawn. They had drinks together. They hung out with each other. During the course of conversations Hank revealed things about himself that then could have been known by Dove. None of these interactions could have occurred while he was wearing the Hawk spandex. When Hawk and Dove became a full-blown series and the Kesels continued as writers, they continued their brilliant formula of using high proportions of "down time" in each issue. We see Hank and Dawn interact with their parents (watching Dawn try to cope with having a secret identity is often hilarious and frequently charming). We smile as Ren helps them cover up their secret, and even bite our fingernails when she gets absorbed in some of their wilder cases and puts herself in danger. We learn, not just about Hank and Dawn's pasts, but about the private lives and secrets of Kyle and Donna too. Again, there are plenty of super-fights. Kyle's past includes a wayward aunt who was once a hippie and has a record from having set bombs. The aunt is being hunted by Shell-shock, who is a super-villain, so of course, Hawk and Dove end up battling her. But the point here is that this is not a pure-action battle of hero against villain for the sole purpose of having a battle, the way so many comic-books seem to be written today. Rather, there is a deeper story here involving the personal lives of Hank and Dawn and their friends. This gives meaning to the fight. It's not just about action here. Rather, you're moved to pity or sympathy, to regret or anger, by the character interactions from which the fight is derived. This, then, is the lesson that comic-book writers can learn from Barbara and Karl Kesel: the use of down time to add depth to characters, and soul to the story arcs of their comic-books. Mindlessly flinging the heroes from one story arc to another, without giving them a chance to recover, breathe, and have any semblance of a "normal life" doesn't make the comic more "exciting" -- rather, it takes away the characters' humanity. And it's their humanity, not their powers, that make us cheer these characters on. Barbara and Karl's Hawk and Dove, above all else, seemed like real, live human beings. And so I cheered for them, and loved them, and was very upset when the series ended and I could read no more about them. By comparison, too many of today's superhero characters are spandex cut-outs. The New 52 Hawk and Dove are just empty suits -- heroes with no real humanity behind them. But it's not just these characters. Superman is the same way (at least since George Perez stopped writing it). Even Batgirl, as much as I like the series, has had too little down time in the last 6 or 8 issues. And in 18 issues, Supergirl has had absolutely no down time at all. She's been on earth for 18 months (of our time, not her time, of course), and she still doesn't really know anyone, or have a single real friend (not even Superman). Indeed, in 18 issues of Supergirl, a monthly, regular, main-line coimc series, there is no supporting cast. Not one regularly-appearing supporting character exists in that series, a year and a half in -- not even Streaky the cat! Astonishingly, this lack of down time and of a strong supporting cast is not an over-sight, but seems to be deliberate on the parts of today's writers. How else can you explain solicitations for upcoming comics that say things like "There's no rest for Supergirl after (fill in the name of the story arc that just finished) because she now (fill in what happens to start the next story arc)." The problem here is that "There's no rest" for a character means there's no down time -- and thus, there's little, or no, interaction with the supporting cast (if the writers have even bothered to include one, which they often don't). The writers and editors (and the advertisement specialists) seem to think that having all action and no down time is a good thing. They use it to sell titles (or so they think). But it's not a good thing. Having no supporting cast and no down time hasn't made Supergirl a more exiting series; rather, it has robbed Kara of the most important thing any comic-book character can have -- her humanity. (Don't bother posting some snarky comment about how Kara isn't human because she's from Krypton -- I'm using humanity in the sense of person-hood, not biology.) And without that humanity, the character just becomes a bag of powers that fights other individuals with powers month after month. And again, it's not just Supergirl that has this issue. Lots of other titles do as well. There are a few rays of light in the darkness, however. Somehow, Brian Azzarello has managed, for 18 issues of Wonder Woman, to keep that series out of the DC mainstream, and has managed to avoid getting it sucked into series-spanning crossovers. Wonder Woman has a large, interesting supporting cast and she has plenty of down time in each issue. There are still fights. There is still action. But the characters in it are still human (although, yes, they are also gods, frequently enough -- again, I use human in the sense of the characters seeming to be real people rather than cardboard cutouts). And although the main stories in Justice League are mostly action-action-action, the Shazam side story has had tons of heart and soul. These stories with large supporting casts and sufficient hero down time are the exception these days, however, and that's sad -- they used to be the rule. And that's why, although I am enjoying reading today's comics, I don't like them as much as I still like the old stories form decades past. Because back then, writers like Barbara and Karl Kesel knew how important a supporting cast of characters, and down time for the superheroes, was in building up the humanity of the characters. That humanity made us care about the heroes so that when the action-jaction battle did come, we had someone to cheer. If I were in charge at DC, my first order of business would be to hand Barbara and Karl's Hawk and Dove series to every writer and editor on staff and make them read it, to learn how important down time is. Because when it comes to making characters human, no one did it better than Barbara and Karl. I'm clapping here. Thank you for a terrific post, I totally agree that superhero comics are the worse for being all action, little or no downtime. Much as I enjoy soap for the sake of soap - sheer entertainment - yes, the quiet moments can motivate and illuminate the obligatory fight scenes. Nowadays it seems to be all fight, all the time, with heroes rushing from one battle to another; they're not defending the status quo, because there's no status quo to defend. They're simply fighting to fill the time until the next fight comes along. As you can tell, I completely agree. Most comics have devolved into a "villain of the month" club. And again, I love action and super-fights, very much so... but the quiet moments are important too, and we get so very little of them anymore. It's one reason I really enjoy reading old series like the Kesels' H&D, Simonson's Thor, etc. I just wish most of my old comics had not been destroyed in that flood. I have so few old ones left, and they're difficult to get nowadays.